The ultimate lists of Football Manager 2014 best players. 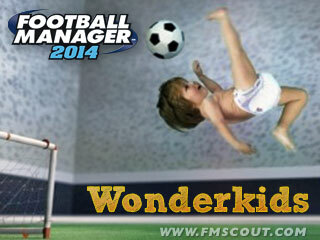 FM 2014 wonderkids, great cheap players and best free agents. The most in-depth list of the best young players in FM 2014 with personal recommendation ratings. Fully updated for 14.3 data. Top quality players that you've probably never heard of. Some players on this FM14 list are well known but there is a huge number of "unknown" type players who perform well above expectations and market value. 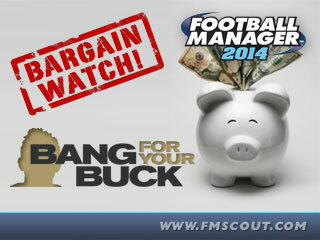 Top quality players you can get for a relatively cheap price in FM14. Best bang for your buck! 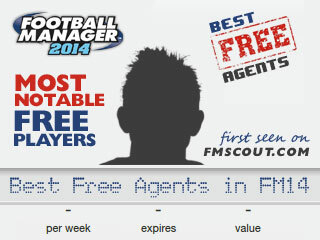 The ultimate list of the most notable free agents when starting FM14, featuring unparalleled depth and most usable presentation. Handcrafted in Symi, Hellas. Page created in 0.226 seconds.